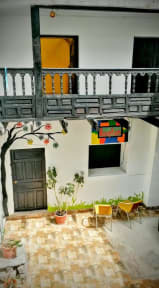 The Grasshopper Hostel i Cusco, Peru: Reservér nu! The Grasshopper Property offer you bbq nights, sunbaths in our terrace and much more! Small buffet breakfast included and free tourist information. Did we mention the Inca picnic day? ask for it at arrival; once a week we organize a picnic in an old Inca trail, just to relax in the middle of nowhere with music and amazing landscapes. Just a stones throw away from our property you will find the greatness and wonderful things that Cusco has for you to enjoy and to experience! We are located two blocks away from the famous San Pedro Market and just 7 minutes walking distance from the main square! One of the main attractions on the surroundings is San Pedro´s Market, where you will not only find souvenirs but also a huge variety of local products, traditional food among others. Enjoy the beauty of many churches on your way to the main square and make some time to visit some of the museums that they have open for you. We offer different kind of accommodation according to your necessities. Whether you take a private room or not, we assure you that you will have the best rest ever! Taxes included. In the case of foreigners, if they don't have the TAM (Andean Migration Card) shall not be exempt from taxes and they will add a surcharge of 18% for the IGV (General Tax to Sales as established by law) . 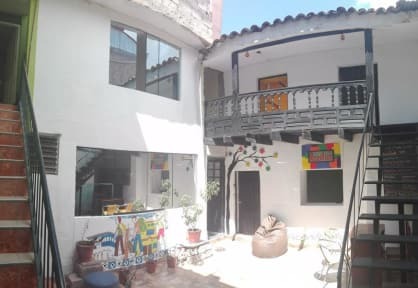 Mi estadía en grasshopper Hostel fue de lo mas tranquilo ya que las personas que trabajan en ahi son muy amables ,carismáticos ,ademas de eso lo mas simpático de eso fue las actividades organizadas por el hostel ,ya que eran bien divertidas y el desayuno muy bueno ,consistente y tiene una terrasita muy agradable donde puedes apreciar una vista hermosa y mas que todo la limpieza es muy buena ,en general todo bien organizado .y bien ubicado tan solo a dos cuadras de la plaza de armas.